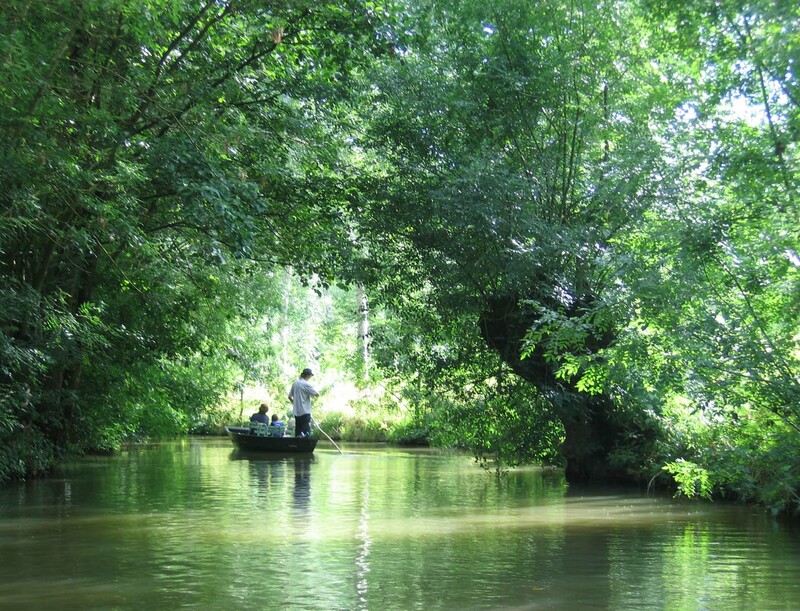 The two-minute video (above) gives you a perfect introduction to a little-known region of France, Poitou-Charentes. Bordered by the Atlantic ocean on the west, this region is rich in history and thoroughly up-to-date. May I tell you just a bit about it? This is the home of Eleanor of Aquitaine, the countess who inherited these lands and as a result was married to both the king of France and the king of England. Today you can visit Eleanor’s chateau in the old city of Poitiers as well as the cathedral she and King Henry of England had constructed there beginning in the year 1162. Another important city of Poitou-Charentes is Angouleme, perhaps best known for its ancient city walls and for the extraordinary Romanesque (pre-Gothic) cathedral which was begun in the year 1107. Today Angouleme also hosts an International Comics Festival. My favorite city in Poitou-Charentes is historic, water-side La Rochelle. Find my post about it here. The Poitou-Charentes region showing its four departments. Julius Caesar gained control of the area that was to be called Saintonge following a battle with the famous Gaul, Vercingetorix in the year 52 BCE. The town known as Saintes, the capitol of Saintonge, is an extraordinary repository of Roman artifacts. A huge Roman arch stands by the river at the center of the city and the remains of a 1st-century amphitheatre can be found there as well. A small museum and repository of discovered pieces of Roman buildings and sculptures is located in the center of Saintes. The city is also the location of three important Romanesque churches and a spectacular cathedral. For those like me who seek out ancient churches for their history, beauty and fascinating sculpture, the region to the east and southeast of La Rochelle is a magnet. Important thousand-year-old churches can be found throughout the region, including those at Aulnay-de-Saintonge and Melle. The cities and ancient villages of the region are fascinating but it is the geography of the region that draws millions of European visitors to this area annually. The beaches along the Atlantic coast are broad, sandy and usually sunny. Islands including Ile de Ré are easily reached by car or ferry. The southern reaches of Poitou-Charentes are home to Cognac – both the beverage and the small city where it’s made. The region surrounding the town is covered wall to wall in grapevines. In Cognac you will find giant old distilleries to visit and to enjoy a taste. Guide books in English for this region are scarce. I really like this one: Poitou-Charentes & the Vendée by Hachette but it appears to be out of print. The linked site shows the 2000 edition, I received the 2003 edition when I ordered from Amazon in the US. In France recently I bought this guide. If you read French you may want to look for it there.